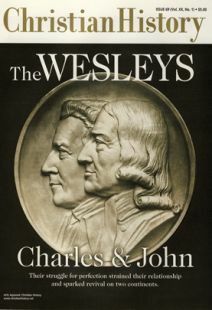 IN 1785, at age 82, John Wesley wrote a wrenching letter to his 77-year-old brother Charles, who had for several years been openly critical of John’s leadership in the Methodist movement. The story of early Methodism is, of course, more than the tale of these two brothers. But the development of the movement cannot be fully comprehended without them— both of them. Among their similarities: Both brothers were published poets, as were their father, Samuel, Sr., their older brother Samuel, Jr., and one of their sisters, Kezzy. Although neither brother composed music, both were musicians— John played the flute and Charles played the organ. When John decided to become a missionary to Georgia in 1735, he convinced Charles to go along. Charles noted in his journal that his older brother always had the “ascendancy” over him and, even though Charles dreaded taking holy orders, John talked him into it so that Charles could assist with the parish work in the new colony. Although he was hastily certified (ordained as both deacon and elder within two weeks instead of the usual interval of two years), Charles took his clerical position seriously. And although John would consistently say from then on that he would live and die a “Church of England man,” Charles was actually the one who held closest to the Established Church as the century wore on. In that arena, he became his older brother’s conscience. The brothers’ relationship was prickly at times. But they had a trusting respect for each other that allowed personal tensions to produce positive results when larger issues were at stake. Neither John nor Charles, however, had a positive experience in Georgia. Both of them lost favor with the political powers they were supposed to assist. Charles, ill and depressed, left for home within half a year. John lasted a year longer, then decided it was better to return to England than face the grand jury indictments his enemies had concocted (see “Wesleys in America,” page 14). Though the brothers’ missionary efforts bore little fruit, their interaction with some German Pietist settlers they met while crossing the Atlantic had important consequences. Boehler’s message was simple: a proper faith will result in a clear sense of assurance of salvation. One cannot have one without the other. And such a faith will be accompanied by love, peace, and joy in the Holy Spirit. At the same time, one will become free from fear, doubt, and sin. Such a heart-centered experience was necessary for one to become a true Christian. Charles was the first to have this “Moravian” experience of assurance. On May 21, 1738, he powerfully sensed Christ’s forgiving presence. “I felt a strange palpitation of heart” was his own unpoetic description. John joined the friends who came to Charles’s lodgings that evening to rejoice with him, pray, and sing a hymn. John was thrilled for his brother, but his heart must have churned as he went back out into the darkness to face his own doubts and questionings. It is no surprise that these two Moravian-inspired experiences would be expressed in terms of heart imagery. Especially noteworthy, however, is the fact that both brothers found the sensation “strange.” Nevertheless, John’s account of his Alders-gate experience, as reported in his published journal, became the normative pattern for many of his followers. Just as the brothers’ spiritual journeys were not identical, their theology and ecclesiology diverged at a few points. Regarding the process of salvation, Charles seems to have had an earlier sense that the “almost Christian,” the one who is struggling with the faith, should be reckoned as having the “faith of a servant.” John persisted longer in believing that the “almost Christian” was no Christian at all, because he had not yet experienced spiritual assurance. John struggled with this question for many years, eventually modifying his opinion to allow “exempt cases"— persons who had not experienced assurance but who were surely real Christians. In his later years, he even allowed that one should take Scripture seriously when it says that a person who simply “fears God and works righteousness” is accepted by him. In general, where the brothers disagreed on theology, John felt it was best if each proceeded with his own strengths. Thus he encouraged Charles to continue emphasizing sanctification as the gift of God’s grace in a moment (instantaneous) while he continued to stress the importance of growing in holiness through nurture and grace (process). Since both approaches would meet the same goal— to spread scriptural holiness across the land— both were beneficial. Charles was only lukewarm toward outdoor preaching, and he questioned the large numbers that George and John reported at their gatherings. Charles viewed lay preaching even more skeptically. John, however, was convinced (by his mother and his own observations) that lay preachers, such as Thomas Maxfield, could be channels of God’s redeeming grace. John’s conviction that lay preachers should work full-time, combined with his hesitance to pay them a sufficient allowance, rankled Charles. Charles thought that such an arrangement gave John unconscionable control over the preachers’ lives. John “ruled with a rod of iron,” to use Charles’s phrase. Unfortunately, this letter made its way into John’s hands. John quickly scratched off a nasty note to Charles, accusing him of dipping into the funds of the society for his expenses when John was already providing him an allowance of 50 pounds, plus a healthy annuity of 100 pounds from the book funds. Although the sum was more than double what John allowed himself, John failed to consider that Charles was married with three children. In these conflicts over lay preachers, the brothers mediated each other’s extreme views. John kept Charles from being too harsh on preachers’ abilities, and Charles reminded John of the preachers’ legitimate financial needs. As Charles once said, John’s first object was the Methodists, and then the Church; Charles’s first concern was the Church, and then the Methodists. His ordination of two preachers as deacon and elder for that task, and his setting apart of Thomas Coke and Francis Asbury as general superintendents (they assumed the title “bishop” later), was done in private— against the advice of, and without the knowledge of, his senior preachers, including Charles. By man’s or woman’s whim? If John had ignored Charles’s anxiety in this matter, the Methodists might have found themselves out of the Church before their time. On the other hand, if John had acquiesced to Charles, the American Methodists would never have received ordained preachers. They likely would have been forced to remain a subset of the Anglicans who weathered the Revolution and eventually became the Protestant Episcopal Church. Instead, by the nineteenth century, the Methodists were the largest Protestant denomination in the United States. Although Charles is better known as a hymnwriter, John had published poetry more than a decade before Charles. John even published a hymnal alone in America. When Charles’s poetry began appearing in 1738 and beyond, it was generally in collections published under the name of both brothers. The more or less definitive Collection of Hymns for the Use of the People Called Methodists included 525 hymns. Most were written by Charles, though John contributed some, including translations from German. All of the hymns passed under John’s editorial pen— a vital step. John examined adjectives theologically. Occasionally he found Charles’s hymns too effusive, too Moravian. John amended some of his brother’s amatory phrases: “When, dearest Lord” became “When, gracious Lord.” John excluded “Jesus, Lover of My Soul” from the 1780 collection entirely. Besides needing literary and theological revision, many of Charles’s poems had as many as 20 verses. John picked the best verses and occasionally divided a long poem into more than one hymn. Charles did not always accept his brother’s limits. Shortly after John worked out an agreement with Whitefield and the Calvinist Methodists to avoid contentious terminology, including any reference to “sinless perfection,” Charles worked that particular phrase into one of his new hymns. Also, on more than one occasion, Charles slipped small collections of hymns to publishers without his brother’s knowledge. The 1780 hymnal truly reflected the brothers’ symbiotic relationship. This “little body of experimental and practical divinity” provided the most popular and lasting channel for spreading the Wesleyan theology. In the later years, Charles spent more and more time with his family, especially his musician sons Charles and Samuel. He still preached in the London societies, but he rarely attended the annual Methodist preachers’ conferences after 1765. Like a good Anglican, Charles was buried in the graveyard of the parish church he attended in Marylebone Street. John, on the other hand, had for some time doubted the necessity of being buried in consecrated ground. “How deep is it consecrated?” was his skeptical question. Consequently, John’s burial in 1791 took place behind the Methodist New Chapel in City Road. That building itself embodied the ambiguity of the Methodists’ ecclesiastical situation. More than just a preaching house, it was built on a sacrament plan— the first Methodist building to include an altar and communion rail. Never mind that the structure was set back from the street in accord with the legal requirements for a dissenting meeting house. Although John may have protested that he lived and died “a Church of England man,” his epitaph makes no mention of the established Church. Instead, it reflects more of Charles’s view on the matter. The inscription points out that John’s life intention was “to revive, enforce, and defend, the pure apostolical doctrine and practice of the Primitive Church.” These words bear testimony to the fact that Charles ultimately was unable to keep his brother within the fold of the Church.